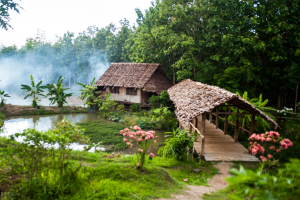 Rustic Pathways – winner of the Best Youth Tour Operator award at the 2015 Global Youth Travel Awards – is looking forward to a year of helping volunteers and local communities grow. We took some time to catch up with them and find out what the organisation has in store for the New Year. Is youth and student travel getting younger? In other words, do you think more school-aged children are travelling internationally independently of the family? Student travel is absolutely getting younger. More school-aged children are travelling internationally independently of their family, and this is a wonderful thing! This sort of travel allows students to learn more about themselves and the world. Rustic Pathways programs provide students with the structure and support to learn and grow, while giving them the ability to explore, ask questions, and fully immerse themselves in a different culture. Our programs, and our local staff members, provide them with a rich, authentic travel experience, incomparable to most family vacation trips. Independent travel also encourages students to think globally and to make connections across cultures. It also teaches the future leaders of the world compassion and understanding, both of which are essential to making decisions that will create a positive impact worldwide. Are there also older people travelling in youth-inspired ways? Can you offer a personal story or example? An authentic travel experience is powerful and it changes you in a very positive way. Travellers of all ages are looking for authentic experiences. Parents especially want to have that experience with their children. They want to immerse themselves in the local culture and have conversations with the people who live there. Each year we run several family programs that allow parents and children to experience that together. We love seeing the travel world move more and more in this direction each year! What will change next year in terms of environmental initiatives/actions in the travel industry? How will consumers be affected or involved? Each year our environmentally focused programs, like our Marine Service and Adventure program in the Fiji Islands, become more and more popular among students. These programs allow students to make a very tangible impact. This past summer Rustic Pathways students planted 9,156 mangrove trees during this program. One mangrove can offset 800 kilograms of carbon dioxide. That’s 7,200 metric tons of carbon offset, which equals the energy of 657 homes! We partnered with Sustainable Travel International (STI), a global NGO and world industry leader, to evaluate our ongoing impact and help us operate in the most responsible manner possible. We are also supporting STI’s 10 Million Better campaign to improve 10 million lives over the next 10 years through travel and tourism. We are always try to find ways to make our travel more responsibly. For example, instead of buying small bottled water on our programs, we buy large jugs and have our students and staff refill reusable water bottles. Overall, we’ve seen more travel organisations making similar choices and more travels are choosing to pay a premium to carbon offset their airfare or other transportation. 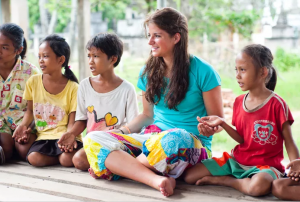 Will young work-experience or volunteer travellers face any special challenges or opportunities in 2016? How will your organisation help them? Volunteer travel is growing and we love seeing that, but we’re focused on making sure our volunteer travel programs benefit both our students and the communities in which we work. We take a comprehensive approach to service and work directly with community partners from the design process to monitoring and evaluation. We focus on supporting long-term initiatives and we design our programs around our service projects, not the other way around. Our programs are designed intentionally to promote student growth. Rustic Pathways students are encouraged to interact with their surroundings, form meaningful relationships around the world, try new experiences, and reflect upon their personal growth throughout the program experience. 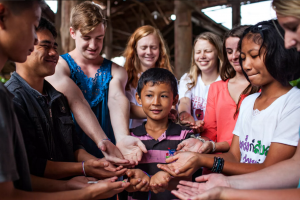 The Rustic Pathways Foundation allows us to continue supporting communities all year round and our alumni association works with students who are inspired to continue supporting the communities which welcomed them during their travel experience long after their trip has ended. Will the refugee crisis in Europe challenge the definition of cultural exchange and the opportunities for young people to take part in cultural exchange travel? We hope the refugee crisis in Europe will help facilitate more cultural change and encourage young people to welcome others. Home, and what home means, is something most students explore through our programs. Several of our service projects work directly with refugees, including our Beyond Capitol Hill Programme in the Baltimore, MD and Washington, D.C. areas. This past summer, students and staff worked with almost 100 kids with the Baltimore City Community College Refugee Youth (RYP), an organisation that helps young refugees adjust and transition to their new lives in the United States. Rustic Pathways students were the first to welcome kids as they got off the school bus and walk with them to the classrooms. As part of the RYP summer program, Rustic students helped refugee students with art projects, dancing, games, educational assignments, and creating an overall positive learning environment throughout the day. The summer program is designed to help refugee students learn English and make friends while getting used to a daily routine of following rules in a school environment. Many have never been to school before or have been out of school for 3 or 4 years and are not used to the structured environment or to sitting down all day. Our students, and even our program leaders, drastically changed their perspectives regarding welcoming refugees into their home communities after working with RYP this summer. How do you plan to promote your 2015 Global Youth Travel Award throughout the coming year? We will continue to share our 2015 Global Youth Travel Award for Best Youth Tour Operator with our audience through email and our social channels. We will also be adding the award to our website.